rapidFLIM measurements enable the imaging of dynamic processes via fluorescence lifetime imaging (FLIM). This new approach allows for fast FLIM acquisition up to several frames per second for imaging of dynamic processes (e.g., protein interaction, chemical reaction, or ion flux), highly mobile species (e.g., mobility of cell organelles or particles, cell migration), and investigating FRET dynamics. More than 10 frames per second can be acquired, depending on sample brightness and image size. Time-Correlated Single Photon Counting (TCSPC) is used to determine the fluorescence lifetime. 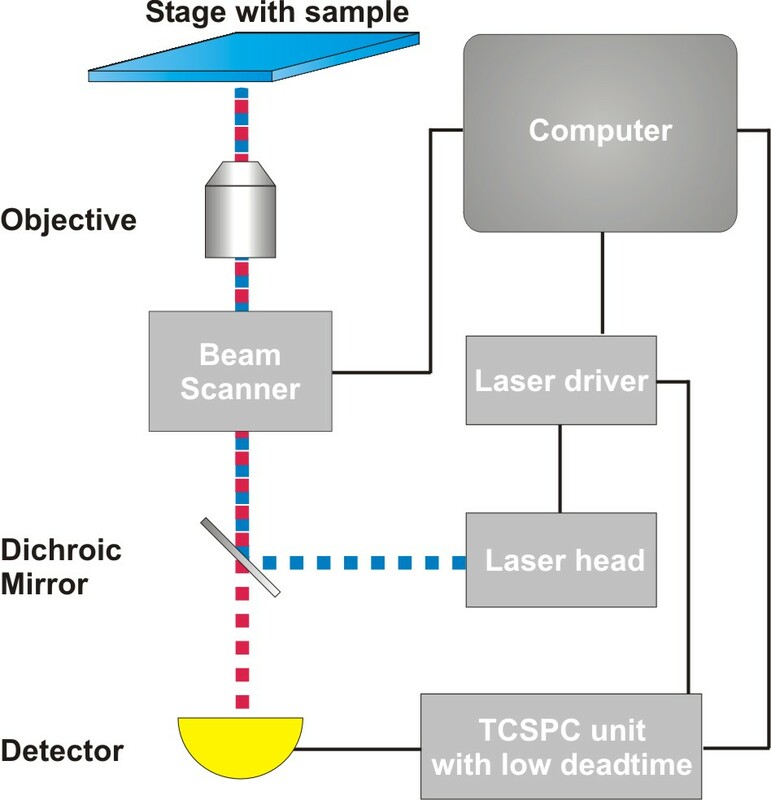 In TCSPC, one measures the time between sample excitation by a pulsed laser and the arrival of the emitted photon at the detector very precisely with picosecond accuracy. Classical TCSPC electronics as well as single photon counting detectors have dead times on the order of 80 to 100 ns. Within this time the system is busy with data processing and can not detect any other photon. The dead time is typically longer than the repetition rate of the excitation pulses. Thus, if more than a photon is emitted per excitation cycle, it can not be detected. To avoid this situation that would lead to measurement artefacts, it is necessary to work in conditions in which most of the excitation pulses lead to no emission, i.e. when only receiving one fluorescence photon out of every 50-100 laser pulses. This requirement slows down the FLIM acquisition time. In order to acquire a FLIM image with a confocal microscope, one typically scans a pulsed laser beam accross the sample. In case of a fast scanning system, this very often leads to only a few detected photons per pixel, which will not allow proper FLIM analysis. It is therefore necessary to increase the number of detected photons per pixel either by extending the pixel dwell time or by accumulating several frames to sum up the photons. This is another reason why it typically takes several seconds up to half a minute to get a good FLIM image. To speed up the data acquisition, a TCSPC unit with a very short dead time like the TimeHarp 260 NANO/MultiHarp 150 must be used. The short dead time of < 1 ns permits to detect several photons within one excitation cycle. Although the temporal resolution of the TimeHarp 260 is only 250 ps, it is still sufficient for most FLIM applications. With this TCSPC unit and the much lower dead time one can now detect many more photons within the same time which speeds up FLIM acquisition significantly. Confocal Laser Scanning Microscopes (LSMs) are widely used tools in cell and molecular biology, biochemistry and other related sciences. PicoQuant's LSM Upgrade Kits greatly enhance the capabilities of these microscopes by extension to time-resolved techniques, and thereby providing not only Fluorescence Lifetime Imaging (FLIM) but also Fluorescence Correlation Spectroscopy (FCS) and a wealth of other time resolved techniques. 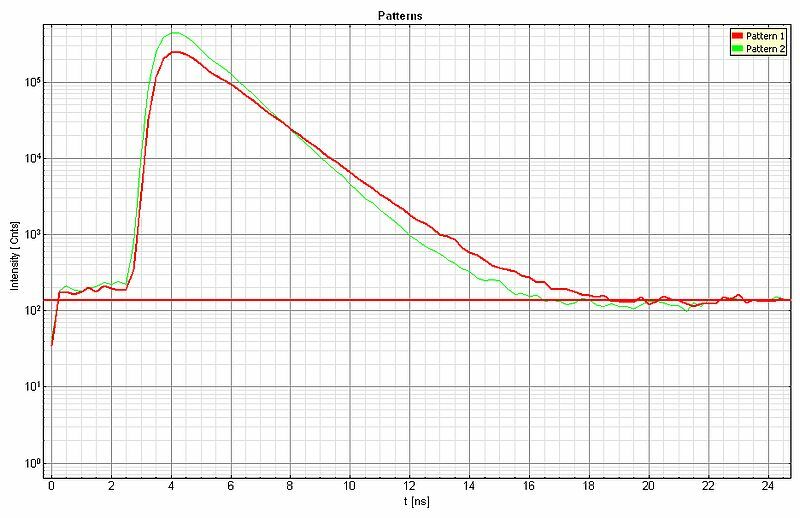 For rapidFLIM, the LSM Upgrade Kit must include a TimeHarp 260 NANO/MultiHarp 150 Dual TCSPC unit along with a PMA Hybrid detector possesing a very low effective dead time. Furthermore, a PC with an SSD is required for fast data processing. Studying fast changes of the fluorescence lifetime caused by e.g., variations of ion concentration or other local parameters such as pH value or oxygen concentration in the fluorophore environment. 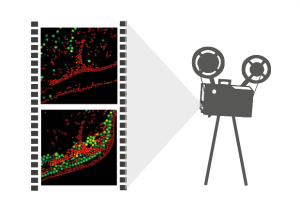 Perfoming live cell observations such as fast acquisition of FLIM z-stacks, time series, tissue autofluorescence, or dynamics of cell metabolism. Using the characteristic autofluorescence for certain tissue types to study, e.g., the dynamics in cell metabolism. To achieve high detection rates of up to 30-40 Mcounts per second, there must be enough photons coming out of the sample. Low or endogenous expression levels of fluorescent proteins will usually not be enough to work. Currently, GFP seem not to be suitable fluorophore for rapidFLIM, since it shows a lifetime change at higher excitation power. An alternative to GFP would be the fluorescent protein Venus (see Examples tag), the snap-, halo- and tub-tag labeling technology for site-specific protein modification using organic dyes, or new in vivo STED dyes, such as Silicone Rhodamine from Spirochrome. These dyes are very bright, stable, can be used in vivo, and would overcome the limitations of fluorescent proteins like GFP. Living mammalian cells expressing two different plant transcription factors (TF) fused to the fluorescent protein Venus were repeatedly scanned with one frame per second (30 µs / px) to follow the protein dynamics within the cytoplasm (type 1 TF, top video) and cell nucleus (type 2 TF, bottom video). Venus shows a stable lifetime and low bleaching at high count rates and thus is suited for rapidFLIM. It was possible to image structures within the nucleus as well as cytoplasmic vesicles with about 1 frame per second. More than 100 photons per pixel could be collected. The bleaching at these high count rates was very low. It could even be minimized by opening the pinhole (sacrifice some resolution) and reducing the laser power. Each of the videos contain 40 frames. Sample courtesy of Stefanie Weidtkamp-Peters, CAI, University of Düsseldorf, Germany. Fast FLIM movie showing the autofluorescence of daisy pollen. The sample stage was moved during the scanning. The high flexibility in the lipid composition of giant unilamellar vesicle (GUV) membranes makes them prime candidates for investigating the interactions between lipids and specific micro-domains. For this purpose, we used phase separated GUVs consisting of a lipid ordered (lo) and a lipid disordered (ld) domain. Our rapidFLIM approach allows differentiation of lifetime patterns even in the case of moving vesicles.In phase separated GUVs, the fluorescence decay of C6-NBD-phosphatidylcholine (NBD) contains both a short and a long lifetime component. The lifetime distribution shows clearly that the longer component (11 ns) is solely found in the lo phase, while the short component (7 ns) can be attributed to the ld phase. Furthermore, the second dye-labeled lipid N-Rhd-DOPE that was added to the GUVs is known to incorporate only into the ld phase. Since the rhodamine dye labeling this lipid can act as a FRET acceptor, the NBD lifetime can be therefor even further reduced in the ld phase. The video shown here contains 200 frames that were recorded with a frame rate of 5.6 fps. The diffusion behavior of two kinds of dye-labeled beads, monitored via rapidFLIM, is shown. The large beads with a size of 3.42 µm are labeled with Nile Red showing a fluorescence lifetime of 3.3 ns. The smaller bead population (average diameter of 2.07 µm) contains the dye Dragon Green featuring a fluorescence lifetime of 4.0 ns. The two species can be distinguished based on their lifetime difference of about 700 ps. The beads form a random structure at the edge of the water droplet, which is subsequently disrupted by addition of another water droplet. The diffusion processes lead to the reassembly of a similar structure over time. The movie was acquired with 8 µs pixel dwell time corresponding to about 3 frames per second. In one frame maximum 300 photons per pixel were detected. 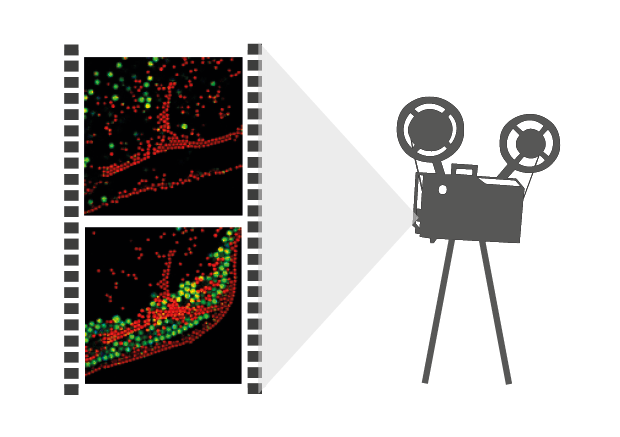 The diffusion behavior of two types of dye-labeled beads was monitored via rapidFLIM, as above. Doubling the image acquisition speed by reducing the pixel dwell time towards 4 µs (about 6 frames per second) results in more noise in the FastFLIM image leading to a lower FLIM contrast, as can be seen in the top video. The lifetime contrast can be enhanced by applying the pattern matching approach. For each species, a lifetime pattern was generated (shown below: green curve = Dragon Green, red curve = Nile Red) and the recorded FLIM data was analyzed, resulting in the second video with improved lifetime contrast.